Because your photography business is based around shoots, a lot of Light Blue’s features are centred around shoot records, too. Whenever you receive a new enquiry, we’d recommend creating a new shoot record. It’s all even easier if you’re using one of Light Blue’s built in forms or one of our fantastic API integrations, because all of this information simply flows into Light Blue’s Inbox. Recording all of your enquiries means that you can be reminded to follow each of them up. That doesn’t have to take long, a simple email template and/or SMS message can be sent with just a few clicks and will gently push up the number of converted enquiries through the year. Managing the enquiries that don’t book. Inevitably there will be enquiries that don’t come to fruition. Prospective clients may respond and let you know that they’re not going to make a booking with you, or they may simply not get back in touch with you. Enquiries that let you know that they’re not going to book can be marked as cancelled right away. Recording a cancel reason can be helpful for reporting later. Enquiries that have gone stale can be managed in a few ways. 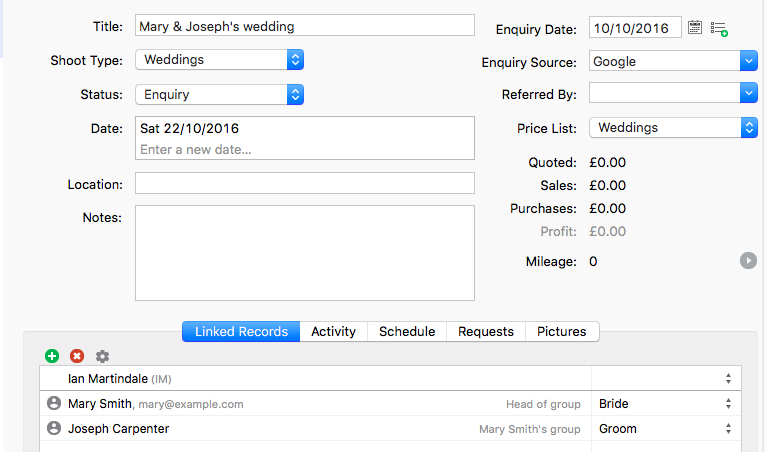 There’s a built in quick query in the Shoots view which will show all enquiries that don’t have any outstanding tasks associated to them – presumably by this point you’d added your enquiry workflow and have completed all of the tasks (responding to the enquiry and following it up some time later). You may prefer to have a task within your enquiry workflow which reminds you to mark the shoot as cancelled so many days after the enquiry date – it’s a basic way of managing it and you’ll need to remember to disregard and delete that task if the enquiry does get confirmed. You could create a more detailed query that shows enquiries for a specific type of shoot that you followed up a few weeks ago and still don’t have any outstanding tasks – it’s reasonable to assume that these enquiries aren’t going anywhere and can now be marked as cancelled. By recording all of your enquiries in Light Blue, you’re building up a wealth of useful information that can help to guide your future marketing decisions. Even if the enquiry doesn’t lead to a booking, it’s worth having that information so that you can measure the effectiveness of your marketing. Using custom reports and the list view – which we talked about in this article – you can see which dates are proving most popular, when the peak times for enquiries are, you can compare this years enquiry volume with that of previous years, you can track your enquiry conversion rate and you can also see which of your marketing streams are providing the most enquiries and conversions. The more information you have about your business, the more you can do with it and the harder you can make it work for you. Light Blue makes it easier than ever to stay in touch with your clients, or make sure that they turn up for their appointments because you can send text messages directly from within our desktop and mobile apps. Text messages can be sent to individual clients, but we’ve also created tools that make it easy to send messages to a selection of clients, or send out reminders for the shoots and appointments that they’ve booked with you. Your clients’ replies can go straight to your mobile phone, and our customisable templates make it easy to set up personalised messages using our mail-merge tags. You don’t need a subscription to our online services to send text messages from Light Blue, and text messaging credits cost as little as 7p per message. We’ve given everyone five free credits, so that you can try it out for yourself. You can find out more about Light Blue’s text messaging features in this short video tutorial, and we’ll be presenting a webinar that goes into more detail at 13:30 on Wednesday 9 November. As with all of our webinars, we’ll be going into more detail than we can in our short video tutorials and also answering any questions that you might have about our text messaging service.